Close up photography opens up a whole new dimension for us. It exposes a world that we normally do not see, details that are usually missed. These are things that can be observed only upon closer inspection. Why do we miss them in our everyday, casual look around? Our eyes are busy organs. They are trained to scan but not to scrutinize. They have a tendency to see things as a whole, but not to examine closely. Our eyes, with stereo vision, appreciate panoramas but, since they are not of binocular vision, will likely overlook a spot in a wide field. Highlighting subjects in photography means going in close, looking in and not looking at. Though panoramic photography affords us to look at the grandeur of vastness, so does close up photography but on a different dimension and scale. And this requires perception and practice. 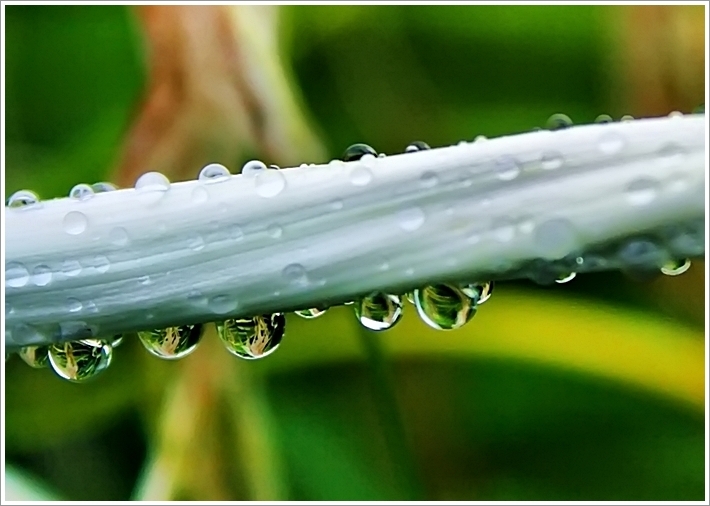 You know the picture above are droplets but what you didn’t know is that they are on a two-inch petal. For all you know they can just be watery bumps on a bridge spanning a chasm. Scalability in the micro world can create illusion. They can be mysterious but at the same time pleasant and attractive. Learn to stay still and peer at nature. In the middle of the forest our inclination is to gaze up with awe at giant trees, yet there is an unseen world right at our feet waiting for us to have a look and take notice. This entry was posted on March 18, 2013 by Junsjazz. It was filed under Articles, Macro, Nature, Textures, Tips and was tagged with articles, close up photography, colors, dewdrops, flower, junsjazz, macro, nature, photography tips. Thank you Ksenia! Great images you have in your blog. Keep on clicking!